FOR THE next couple of issues, I want to focus on mistakes made by beginning players - meaning those who are literally picking up a cue for the first time to those who have played a little but never had any formal instruction. Certainly these might appear to be lessons we all should have learned by now, but let's reexamine some common problems to see if we can reinforce proper fundamentals. First, I want to talk about consistency. It is no secret that a solid, dependable stroke is a result of proper fundamentals. So the key to building a stroke that will stay with you - even in the most pressure-packed situations - is examining every single detail of your preparation. Let's take a minute to examine at how you look at a shot. Once you're down on the cue ball, it is important to have a rhythm to the movement of your eyes. Always try to keep the same pattern of what you're focusing on, looking back and forth at the object ball and cue ball. You might think you always use the same eye movements, but have you really examined it? Line up your cue, so that it is perfectly in line with the proper aiming point. 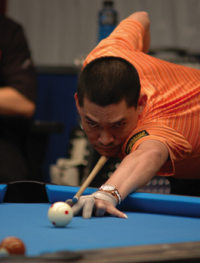 Moving your focus from the object ball to the cue ball and back, make sure you are properly lined up. Take no less than three to five warm-up strokes. This will also give you time to focus on a specific spot on the object ball and allow you to trust your alignment and aiming. If you don't trust your point of aim, you will get in the habit of steering the cue ball or the object ball. Finally, once you are comfortable with your stance and aim, the object ball is the last thing you should look at when you make the final delivery. Bring the cue back slowly on the final stroke - this will prevent you from rushing, which creates a herky-jerky motion. This is just part of the puzzle of a consistent routine, but it is absolutely vital that you make a conscious effort to develop a rhythm to your eye movement before and during a shot. Try to develop a pattern you can trust. It will pay off when you are faced with a stressful situation.